Something that become very apparent when we asked readers to nominate their favourite Brisbane market stall a few weeks ago is that you guys really, really love the Goat Pie Guy. A wander around the Mitchelton, New Farm or Manly markets on a weekend reveals a similar story; wherever the Goat Pie Guy is set up is always one of the most bustling, most happening spots in the whole place. The reasons for this are pretty obvious. The pies are amazingly delectable. There are various interesting flavours to choose from, such as the Himalayan (a rich Nepalese curry sauce, with ginger, tomato and spices) and the Grecian (with rosemary, confit garlic, white wine and lemon zest). And on top of that, the guy behind the Goat Pie Guy, Mick Hobson, is friendly, approachable and always up for a chat. TUL: How did the Goat Pie Guy come about? I've always been a big fan of goat meat, and one fateful evening I cooked a goat shoulder with leeks, onions, honey and thyme for my father-in-law Jim, and it was a hit. This would become the first recipe for the Deluxe Goat Pie. That night Meg, Jim, Shiraz and I hatched a brilliant plan to share my love of goat meat with the world and so you have... the Goat Pie Guy. TUL: Why do the pies taste so good? What's your secret? It's not really a secret that the freshest, highest quality ingredients, treated with respect, taste better. I am a chef by trade and a foodie by nature so I make a product that I would like to eat, full of flavour, and generous. TUL: What do you say to people who are hesitant to eat goat meat? We are always having to convince people to sample at the market and their objection usually relates to a previous cooking failure or a memory of someone's inedible dish. I describe the Boer goat meat as a delicious sweet meat that is not particularly gamey. People are always pleasantly surprised, then enthusiastic, then addicted. TUL: You've got some fascinating varieties of goat pie on your menu, how do you come up with the ideas for recipes? Travelling to different places gives me so much inspiration for new recipes, whether that is Asia, Europe or dinner at a mate's place in Tassie. Plus there are many international dishes that lend themselves naturally to goat meat; like the curry that found it's way into the all-new Jamaican Goat Pie. TUL: Have any flavours bombed because they were a bit too left-field for people to handle? Not yet! Most flavours are developed after good discussions with our customers and foodie friends, so I have a good idea of what people want to taste next. The Deluxe Goat Pie will always be my first love, but my favourite has become The Indonesian Goat Pie. I have always been crazy about rendang, it has so much fragrance, texture, and taste and is a perfect match for the succulent goat meat. TUL: Tell us about a typical week for you. My week starts on Tuesday shopping and prepping for the week ahead. On Wednesday I make the pie mix, Thursdays and Fridays are flat out making pies for wholesale customers and the markets on the weekend. Saturday and Sunday, I go to the market and get to talk to our customers, which I consider my reward for all of the hard work. Monday I sleep. TUL: What's the best part about hanging out at markets all the time? Great atmosphere, where I have made some very good friends, plus I don't have to go far to shop for our groceries. Seven different breakfasts is a bonus! TUL: What are some of your favourite things to do/places to go in Brisbane in your free time? Every chance I get I like to go camping on Bribie or Moreton Island to relax and cook over the campfire. This is where the new pie creations are developed and fine-tuned (with a little red wine). 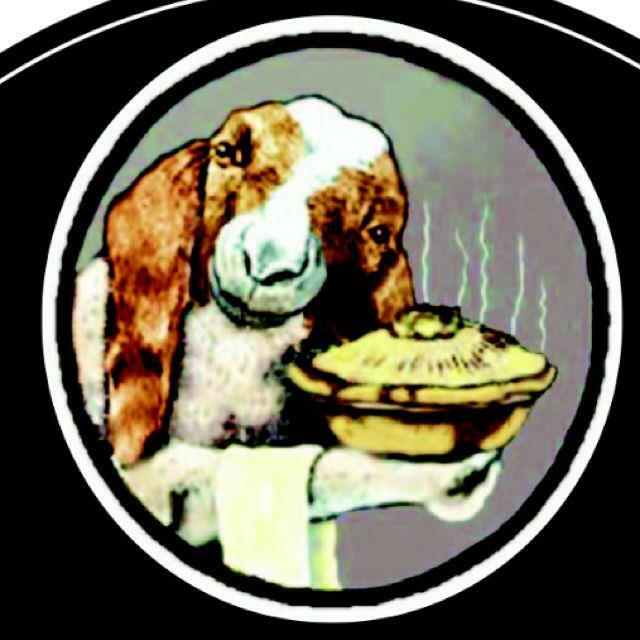 TUL: How come there is a goat serving up one of the goat pies in your logo? Is he a traitor to his species? That's Billy! I guess he figures as long as he makes himself useful he's safe.